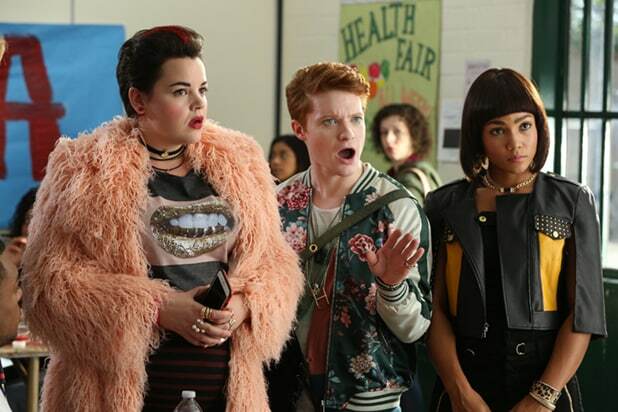 Paramount Network and parent company Viacom have opted not to air the shelved “Heathers” adaptation, instead planning to shop the series elsewhere. In an interview with The Hollywood Reporter, Paramount development exec Keith Cox said some of the show’s content — guns in the classroom, the explosion of the school at the end the season — was deemed unfit to air on the younger-skewing network in the wake of the Parkland shooting. “We had multiple meetings, and in the end, we didn’t feel comfortable right now airing the series and I’m not sure when there might be a time that we as a youthful brand at Viacom would feel comfortable,” said Cox. A loose adaptation of the 1988 cult film starring Winona Ryder and Christian Slater, the “Heathers” series stars Grace Victoria Cox as Veronica Sawyer, a high school who deals with a very different but equally vicious group of Heathers — Melanie Field as the body-positive mean girl Heather Chandler, Brendan Scannell as the genderqueer Heather Duke and Jasmine Mathews as the biracial lesbian Heather McNamara. It was initially slated to premiere in March, but was shelved “out of respect for the victims” of Parkland. It was later rescheduled to premiere in July. The awards show was originally scheduled for April 8, 1968, but was postponed two days out of respect for Dr. Martin Luther King Jr., who was assassinated four days earlier. A number of attendees, including Sidney Poitier and Sammy Davis Jr., planned to attend the slain civil rights leader's funeral -- held on the same day as the original Oscars date -- and had said they wouldn't attend the awards show. The Joss Whedon supernatural drama was affected not once but twice by real world events, specifically the Columbine massacre. The show's third season had two episodes that featured school violence. One, called "Earshot," featured a plot concerning a student who goes to the top of a tower with a rifle. It was set to run a week after Columbine, but was pulled and postponed. The Season 3 finale "Graduation Day, Part Two" also featured violence on school grounds. Specifically (and spoilers for a nearly 20-year-old episode), the school is destroyed. Two hours before it was set to air, the WB postponed the episode, fearing fallout from Columbine. The finale's airing was delayed for two months, but fans were furious about the decision and the network ended up posting it online. That year's Primetime Emmys were set to air on Sept. 16, 2001, but the terrorist attacks of Sept. 11 caused it to be postponed. The awards were postponed a second time after the U.S. launched airstrikes against Afghanistan. 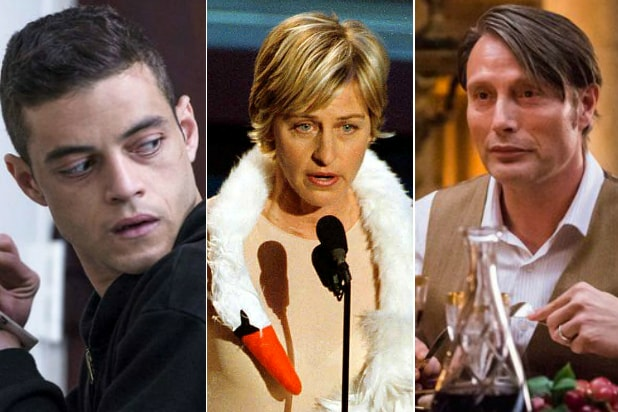 The ceremony was eventually held in November, with Ellen Degeneres hosting, but it still marks the first and only time a major awards show had to be postponed twice. In the Season 8 episode "The One Where Rachel Tells..." a scene that originally had Chandler joking about a bomb in an airport -- leading to him and Monica getting detained -- was changed following Sept. 11. The scene was reshot with Monica complaining about another newlywed couple that got perks. The Bryan Fuller series about Hannibal Lecter never shied away from gore and viscera, but the show's fourth episode, "Oeuf" was pulled completely from the airwaves. The plot revolved around a woman who was brainwashing children to kill their families. While the episode was set to air in April 2013 -- four months after the Sandy Hook shooting -- NBC delayed airing it indefinitely due to the subject matter. The episode has never aired. "Castle" made a small change following the Boston Marathon bombings in April 2013 since the episode "Still" involves the team looking and trying to dismantle a time sensitive bomb. It was eventually switched with the next episode in the lineup, delaying its airing by one week. When the Bill Cosby sexual assault scandal hit a peak in 2015, many networks and people moved quickly to separate themselves from the comedian. This included TV Land, BET, Bounce TV and other networks refusing to air reruns of his sitcom "The Cosby Show." However, the real loss was from NBC, which decided to cancel plans to develop a new Cosby show. Josh Duggar, the eldest of the titular 19 kids, became the focus of a sexual molestation scandal. However, TLC took a few weeks to issue a decision on the reality show's fate. The network eventually decided to cancel the show. The Season 1 finale of USA Network's hacker thriller had to be postponed because it contained a scene similar to the events that occurred on the same day. In Roanoke, Va. on Aug. 26, 2015, a former reporter killed two of his colleagues live on air. The shooter died from self-inflicted gunshot wounds. In the "Mr. Robot" finale, somebody commits suicide during a broadcast. USA aired the episode the following week. An episode of the IFC mockumentary series starring Bill Hader and Fred Armisen was also postponed due to the Roanoke shootings. "Dronez: The Hunt for El Chingon," was about two journalists who decide to track a notorious drug kingpin despite safety concerns. The episode was replaced with "Kunuk" and aired it a week later. The Season 3 premiere of "The Last Ship" was postponed following the Pulse Nightclub shooting in Orlando. The episode featured a shooting at a Vietnamese nightclub. USA Network shelved the 2017 series premiere of its Ryan Phillippe-led sniper series "Shooter" for a number of months following a mass shooting in Dallas, Texas, which saw 12 police officers and two civilians shot by a sniper during an otherwise peaceful protest. The Paramount Network delayed the launch of its 2018 sitcom based on the 1998 high school-set dark comedy "out of respect" for the victims of the deadly mass shooting at a high school in Parkland, Florida. The original film featured multiple high schoolers killing themselves and each other.